The Route 1 Multimodal Alternatives Analysis meeting is tonight, Wednesday, March 26, from 6:00 p.m. - 8:00 p.m. at South County Center, 8350 Richmond Highway, Room 221, Alexandria, Virginia 22309. Cyclists should consider attending the meeting and speaking out for safe, connected bike facilities. In an earlier survey conducted by the Route 1 team, "On street bike paths separated from car traffic by parked cars or a curb," which are similar to buffered bike lanes or cycle tracks, were the preferred option. 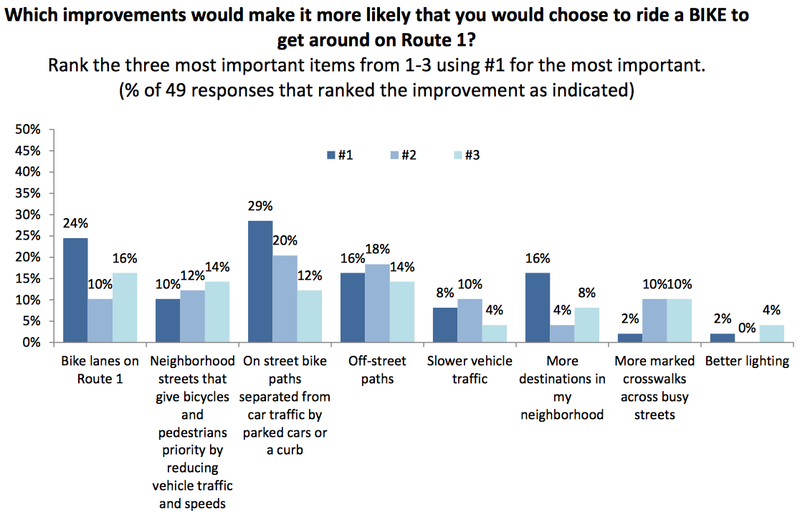 "Bike lanes on Route 1" were the second most preferred option. "Off street paths" or "More destinations in my neighborhood" were third. We much prefer the most popular option from the survey, well-designed separated bike facilities. While parallel sidepaths can be used by bicyclists for short trips, there are many potential conflicts at driveway intersections and with pedestrians. See the presentation from the first meeting, results of the survey, and other info on the Route 1 Analysis meeting 1 page. Click on the graph below to see a higher resolution version.